She received considerable attention, and posed for more than a few photographs. Most importantly, she had fun. (All this was helped by the fact that HeroesCon has a clear anti-harassment policy, and is very much a family-friendly scene.) The traffic was significantly higher today, and there were lots of folks dressed for the occasion. Deadpool seemed to be the most popular costume, but there were also quite a few Dr. Whos (Drs. Who?) and Harley Quinns, along with a sizable Homestuck contingent. However, my favorite non-Spawn cosplayer was a 3-and-a-half-month-old baby dressed as Princess Leia. The sign on her stroller said it all: “HeroesCon 2013 Souvenir”, which puts the lie to at least one stereotype about geeks. The Spawn and I picked up a novel, A Once Crowded Sky, by Tom King. It deals with the reaction of a bunch of former superheroes forced to give up their powers, and it seems interesting. I’m sure I’ll have more to say about it in time. Spawn got to meet a gent known as K-Bo, creator of an online strip called Ensign Sue Must Die, and when we bought a couple of his books, not only did he sign them, he threw in a sketch for the Spawn as a bit of lagniappe. 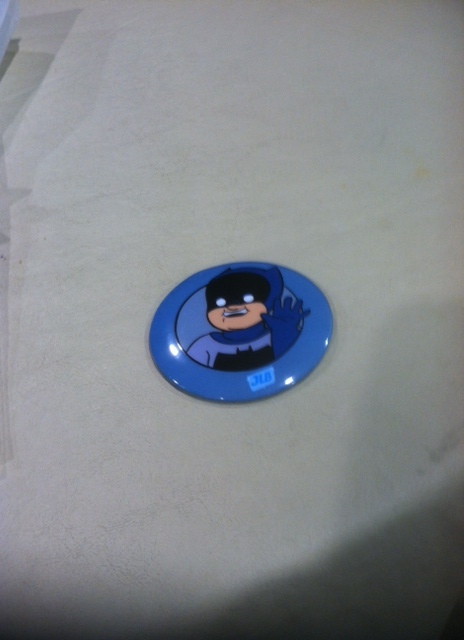 A bit later, as the Spawn was off hanging with some other Homestuck fans, I tracked down JL8‘s Yale Stewart, and picked up a badge of an awkwardly flirtatious 8-year-old Bruce Wayne — somehow, I identify. Actual size: About 2 inches. So after a day of wandering and observation, the Spawn and I finally decided to return to the hotel, only to discover a light rain falling. Fortunately the walk is only a few blocks, so we were damp, rather than drenched. It’s been a good day. This entry was posted in Culture, Family, Literature, Why I Do What I Do. Bookmark the permalink.